Adam Riddle made a Christmas tree out of Costco boxes in protest of early Christmas sales. Isabella, 12, scare up some treats as T Rex. The Lang house has been scaring trick or treaters for nearly 30 years. A lord from the darkside guards the hedge entrance with a double-bladed light sabre. Alex Tilden has been a transplant to Burkeville for 3 years. Strange things in the woods - a mouse and an avocado. The 6th Annual Burkeville Halloween. The Incredibles, AKA the Marten Family from Burkeville. Garnet Angman, as the Great Pumpkin, handing out candy to all trick or treaters. 2018 Chinese New Year Countdown at Aberdeen Centre. Dancers from Cindy Yang Dance Academy doing a costume check of each other perform they go on stage. 2018 Chinese New Year Countdown at Aberdeen Centre. Jayden, 18 months, with grandmother Rong Wu. 2018 Chinese New Year Countdown at Aberdeen Centre. CLF Kung Fu Club lion head performers doing final rehearsal before going on stage. Jame Thompson Elementary School celebrating Chinese New Year. Students watching the acts. Annual Steveston Rotary Club Seniors Christmas Lunch at Steveston Community Centre. McRoberts (green) vs Notre Dame. Soccer hooilgans, McRoberts supporters. McRoberts (green) vs Notre Dame. McRoberts goalie stopping his second shootout kick. McRoberts (green) vs Notre Dame. McRoberts celebrating their win in shootout. Four Hugs A Day...is the minimum. Watching Charlotte Diamond sing her classic tune. Sophie, 1, getting hug from grandma. Charlotte singing I Am A Bubble song. Charlotte Diamond, Elves and the Hug-A-Bugs. Santa's Arrival at Lansdowne Centre with entertainment from Charlotte Diamond. Santa's arrival at Lansdowne Centre. RCMP Xmas Toy Drive at Ironwood Shopping Centre. Tiffany in a marked RCMP car full of toys. RCMP Xmas Toy Drive at Ironwood Shopping Centre. St Nick is knicked by Inspector Sunny Parmar (left) and Chief Superintendent Will Ng. People relaxing in bean bag chairs are reflected in singer David Morin's shades. Kids jumping on top of the world. Alex, 7, and Nika, 5, are tying Richmond with the origin of their parents in Slovakia. Madelyn, 5, and Olivia, 3, Pronyk are experiencing what it would be like to win Olympic medals at ROX tent. YVR Chill Out at Larry Berg Flight Path Park. Marilyn Columbus, a YVR Green Coat volunteer, enjoying a potato swirl on a stick. Wheelchair basketball - Lina, 2, and Koari Green. YVR Chill Out at Larry Berg Flight Path Park. David Morin on stage at YVR Chill Out at Larry Berg Flight Path Park. YVR Chill Out at Larry Berg Flight Path Park. Jamie, 6.5, and Julie, 4, at the big wheel of the YVR Fire and Rescue truck. New head coach Steve Robinson is ultimately focused on leading the Richmond Sockeyes to a Cyclone Taylor Cup this season. The 8th Annual Steveston Dragon Boat Festival. Shao Lin Hung Gar Lion Dance Team parading the dragon. Disability team Off-Balance awaiting their chance in the race. CircusWest - Wren, 6, having a try with the ribbons. Mariachi Las Estrellas de Vancouver is Canada’s only all-female Mariachi band on the mainstage. Women's Open Final - Ireland celebrating their win. Italians celebrating their 1-0 win over India. India's player is about to get a yellow card from the ref in the men's Open Division final versus Italy. Women Division Final - TOKO (white) vs UFV just stole the ball from two UFV players. Gun battle at Riverside Quay. The Valenzuela family are from the Phillipines, leave in Richmond and are proud Canadians. Emily Thompson, 3, and Abby Batalha, 3, waving flags at parade. Julia Zhou (centre) can't get a proper family picture with her kids Andrew (left), 7, and Anthony, 4.5. Lim-Tanlinco family from Richmond and Burnaby ready for the parade. Desire King checking out the strong fragance of Bob Price's Dark Desire Rose at the Garden Show. Grupo America on the Celebration Stage. Brazilian dancers having wardrobe malfunction with gloves before going on stage. Audrey De Boer (far left) leads everyone in the singing of O' Canada. Tony Van, Emma Lia and Owen Morris laying out all the filets supplied by Canadian Fisheries Company for the BBQ. Children's Bike Parade - Vanessa and Rebecca view the parade from a patriotic wagon. Children's Bike Parade - The Matsumura clan from Richmond and Alberta. The RCMP at the 72nd Annual Steveston Salmon Festival Parade. Claire, Jenna, Sophie, and Lilah playing at Terra Nova Adventure Park. Lilah at Steveston Children's Park. Organizing three teams for this year’s Nations Cup soccer tournament, on top of an already busy schedule, Kyle Shury says none of what he does would be possible without his wife Megan. Dolphin Classic organizers Tony Wong-Hen and Bruce Watson. Tim (left) and Stephen Hsia are the brothers who co-designed the glow-in-the-dark Northern Lights toonie, Tim got the credit. Three minutes into the derby, Ashley Mercer, 11, catches one of the largest bullheads measuring 10-inches. Here her dad, Noel, holds her catch because Ashley didn't want to touch it. 27th Annual Bullhead Derby at Garry Point Park. Three minutes into the derby, Ashley Mercer, 11, catches one of the largest bullheads measuring 10-inches. Richmond Golden Rods and Gun Club's Lorne Malkoske uses the blowhorn to start bullhead derby. Chris Bisaillon is baiting his daughters' hooks with a lethal smelling combination of roe and bacon. Daughters' Lauren (left), 9, and Isabelle, 12 at the 27th Annual Bullhead Derby at Garry Point Park. Caelan (left), 7, and Braeden, 5, Mah watching dad put bait on their hooks at the 27th Annual Bullhead Derby at Garry Point Park. Tunnel showing Richmond's part in the 2010 Winter Olympics. The Richmond Olympic Experience at the Richmond Olympic Oval. Ski Jumping simulator. Interactive virtual man that will illustrate the human circulatory, nervous system, skeletal system and muscular system. Demonstrated by Rox volunteer Howard Smythe. The Richmond Olympic Experience at the Richmond Olympic Oval. Information globe of all the participating countries. Jack Parker, a ROX volunteer, teaching Jack Oh, from Vancouver, how to drive the F1 driving simulator. Janice Lambert (left), executive director of Richmond Family Place, and Parm Grewal, executive director of Richmond Multicultural Community Services. Susan Skemp and group of singers will be performing at Richmond Night Market. L-R: Michael Arzadon, Linda Leong Sum, Antoinette Libelt, Dane Szohner, Susan Skemp, Cate Richardson and Nicholas Lee. BC12 speaker of the legislature and MLA Linda Reid, Richmond Mayor Malcolm Brodey, Coun Chak Au and Coun Linda McPhail sign at launch of Habitat for Humanity homes on Ash Street. The Rai family will be one of the occupants of homes built by Habitat for Humanity. Back (L-R) Jeff and Sharon Rai, front (L-R) Ruth, Caleb and James Rai. Anita Cheong, Magnum Projects, Ltd., making foundation ladders. Yolanda Brodoerick, a large individual contributor, try her hand on a mitre saw. New Habitat for Humanity Project on Ash Street. All women day. Rumiia Mataeva, Fluor Canada, painting a sign with row houses on Dayton Court in the background. Experienced Habitat volunteer, Burnett Secondary grad, Amrit Maharaj of Avaram Homes Ltd, volunteers his professional skills as site manager for the Ash Street project. Marlis Joller, KPU Interior Design instructor, cutting 2x4s for foundation ladders. Nicole Newman (left), from New Brunswick, hammering window frames with help from Yolanda Brodoerick. Roseline Dias showing off her hard hat. Strawberry farmer, Bill Zylmans, says this year's strawberry season will be short but delicious. Bill Zylmans, long time Richmond/Ladner farmer. Bill Zylmans in the strawberry field. Historica Canada's Here's My Canada project at AR Macneill Secondary School. Leo Yang and Daniel Davydova doing their schtick. Leo Yang and Daniel Davydova (far right) practicing their schtick while other classmates like Ankson Chan (centre) work on their 30-sec monologue. Jasper Chu practicing in front of his iPhone. Jasper Chu making his pitch. Restoration volunteer Paco Gomez (centre) showing off original pieces from the tram. Volunteers like Meribeth Hardern (left) painstakingly scrap away the years to restore tram parts to original condition. Under the supervision of conservator Andrew Todd (standing), volunteers painstakingly scrap away tram parts to its original condition. Restoration volunteers Mike Fleck (left) and Scott Milne are going through a box of original tram parts and cataloguing them for future reference. Samuel Solomon, 5, showing off his personalized badge. Boys being mustered for their 60 metre race. Wat supporters cheering the numbers on TV. Linda supporters eagerly awaiting results. Linda Reid Campaign Office Linda's son, Will, is under the table. Everyone applauding first set of numbers posted for Linda. Linda Reid Campaign Office War room workers making sure all the numbers are right. Linda watching the first set of numbers coming in. Linda Reid Campaign Office. Linda and supporters keeping an eye on numbers on both TV and internet. NDP head quarters, volunteers waiting for the numbers to come in. BC Provincial Election 2017, Richmond. NDP head quarters. Soccer coach Martin Bittengl from the Martin Bittengl School of Soccer. Soccer coach Martin Bittengl says the age group between 8 and 13 are the golden ages of sport for youth. Andrew Wade (front) is the author of the play with a large cast of characters. A 5-part play performed during a walking tour of Steveston. Vincent Lee (left), Frank the fisherman, and Nina He, Helen the bank clerk. Event organizer Raymond Cheung is emphasizing Canada's 150th. Boris Yeung (left) and Kelvin Lo getting the carnival game prizes ready. Angus Cheung hanging up prizes for Duck Pond game. The important food signs are going up at The Richmond Night Market. Najib Elmi, 11, receives a new kidney from his father, Faysal. At right, Najib Elmi, 11, with his twin nine-year-old brothers Ahmad (left) and Adam. Najib received a kidney from his father, Faysal (background). An example of Xiao Feng’s work, entitled What I saw in Delta, on display at the Lipont Centre until June 4. An example of Tony Chu’s work, entitled Tree 9, on display at the Lipont Centre until June 4. Commemorate the 100th Anniversary of Vimy Ridge at Richmond City Hall Col. Howe Lee saluting during O Canada. Commemorate the 100th Anniversary of Vimy Ridge at Richmond City Hall. Carl Huggins recounting the life of Richmond's Edgar Samuel Turnill who was killed in action at Vimy Ridge in 1916. Commemorate the 100th Anniversary of Vimy Ridge at Richmond City Hall ANAF 284's Bill Reid awaiting signal to call the parade to order. Harvest Power, organic compost to power plant. Opening season of Richmond baseball season at Palmer Field under rain clouds. Mayor Malcolm Brodie throwing out the first pitch. Opening season of Richmond baseball season at Palmer Field under rain clouds. The Parade of Champions. Opening season of Richmond baseball season at Palmer Field under rain clouds. Riley, 2.5yrs, finds jumping in a deep mud puddle more interesting than standing in the rain. Opening season of Richmond baseball season at Palmer Field under rain clouds. Carter Chow reciting the Player's Oath. Opening season of Richmond baseball season at Palmer Field under rain clouds. Opening season of Richmond baseball season at Palmer Field under rain clouds. Keanu, 7, is dying to try out his new mitt and gear he got for the new season. Opening season of Richmond baseball season at Palmer Field under rain clouds. Jake Gustafson, 7, staying dry under a large umbrella. Candidate Lyren Chui feeling exhausted after a long campaign and waiting for the polls to close. Linda Reid, on the verge of winning, receive congratulatory flowers and kiss from husband, Sheldon. Teresa Wat Election Party at RiverRock's Fraser Room Teresa with some jubilant supporters. Harold Steves, with wife Kathy, at NDP HQ explaining what would happen in case of a tie. Richmond Ravens (white) vs Abbotsford Ice. Attempt on goal by Rmd#7 Jaden Cherry. Abby goalie Hailey Macleod and Abby#2 Sarah Stewart. Richmond Ravens (white) vs Abbotsford Ice. Abby #9 Katie Klassen and Richmond #11 Jessi Soon. Richmond Ravens (white) vs Abbotsford Ice. Abby #9 Katie Klassen, Richmond #11 Jessi Soon and Richmond#13 Annelise Wong. Luke Sheehan (left), part-owner of Apex Adventure Plex, and Tyler Montgomery (right), a senior employee from the Saskatchewan facility here to help setup in Richmond. A close-up model of the proposed acute care tower (at top right). The existing north tower is shown as demolished in this rendering. Harvest Power in East Richmond has run afoul with Richmond residents. Graham Turnbull, newly-installed president of the Friends of the Richmond Archives. First salmon-can labels in B.C., printed by Grafton Tyler Brown for John Sullivan Deas. Dr. Antonio Avina, rheumatologist, giving patient a preliminary mobility exam. Richmond Ravens (white) vs Abbotsford Ice in girls ice hockey action. Sinfully the Best Chocolatiers in Steveston are raffling off a giant chocolate Easter Bunny for Children's Hospital. L-R: Anita Schulz (store manager), Sarita Mannoe and Tini the Chocolate Easter Bunny. Part owner Luke Shaheen showing off the yet-to-be finished high performance trampoline zone. Candie Tanaka and Toni Zhang McAfee at Vancouver Lipont Art Centre. Grauer student Samnatha Teo, 10, and Principal A. Ferguson. R. M. Grauer School on Blundell Road opened in 1949. Alex Nixon, Richmond Food Bank Media Liaison, is emphasizing that a food supplement with expired Best Before Date is just as consumerable as a container of stock with a good Best Before Date. Natasha Kis-Toth is Canada's cadet fencing champion. 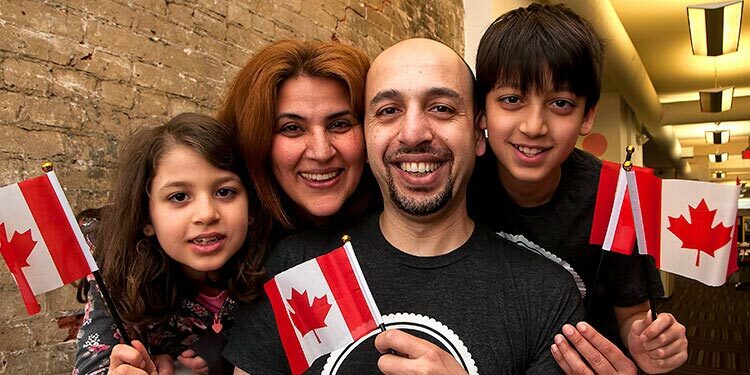 Hussein Hallak says it will cause problems if you expect people in Canada to act like people from back home. 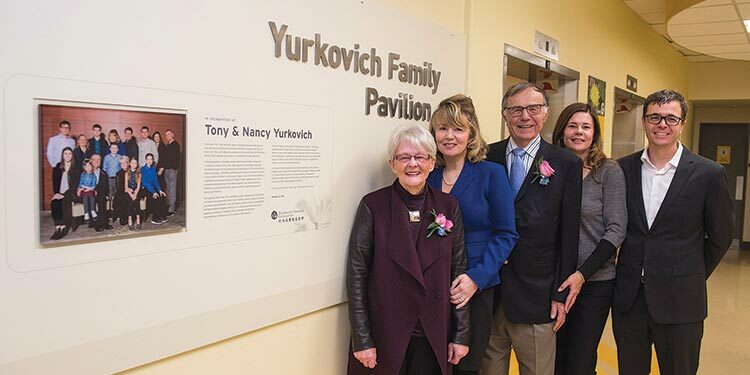 Long-time Richmond doctor and nurse, Tony and Nancy Yurkovich, recently made the single largest gift in the history of the Richmond Hospital Foundation in support of a new acute care tower. There’s plenty of high rise construction in the heart of Richmond. But how much Is affordable? Millions of dollars have been spent to upgrade Steveston, including the public sales float. But what else needs to be done to fix what ails the village. Valerie Wideski is a proud Steveston-London student, but she plays rugby for Hugh McRoberts. McMath teacher Anil Sharma’s photography has been featured in TIME, Entertainment Weekly and Rolling Stones magazines. Steve Robinson is looking forward to coaching the Richmond Sockeyes next season. Protestors on the stage where the announcement of the start of the Massey tunnel replacement bridge project was to have taken place. Ivana Smulik (left) and Sasha Cheung will be serving up goodies for Mother's Day and Victoria Day at London Heritage Farm this month. Some 200 crew members will unfurl the sails of the Kaiwo Maru on Saturday, May 6 at Garry Point Park. Jennifer Yuhasz, a Richmond Archivist and Graham Turnbull, Friends of the Richmond Archives, prepare to digitize a fragile copy of the early Richmond Review. Patient Julia Chayko and Arthritis Research Canada’s Dr. John Esdaile.